On the heels of the Australian GP start this weekend, figured some might enjoy seeing what is different this year vs last year. The major rule changes both technical and sporting are detailed below. For the season ahead, active drag reducing devices which make use of the DRS flap have been banned. In 2012, Mercedes developed a concept which allowed air to be channelled through an opening in the rear wing endplate when DRS was activated, subsequently travelling through the car to help stall the front wing and thus reducing drag. Not only is it now forbidden for the rear wing end plates to transport air around the car, but a similar rule also applies to the centre section of the front wing. This will not, however, affect passive systems as trialled by Lotus F1 Team last season. Indeed there will be much development in this area, with Sauber, Lotus, Red Bull and possibly Ferrari having trialled the concepts in testing. What people call passive DRS is the device that Lotus trialled last year which will uses some speed sensing device whatever that may be to augment or replace the DRS effect where DRS is not allowed. It is an interesting area, but it is a very tricky area to get a signal that is reliable and withstand things like following another car, it is not straight forward” adds Red Bull’s Adrian Newey. When regulations were announced for the 2012 season which would see teams forced to lower the overall height of the car nose for safety reasons, much was made of the somewhat unappealing ‘stepped’ design solution developed by the majority of the grid. While the maximum height limit remains unaltered for this season, teams now have the option of utilising a small piece of laminate – known as a ‘modesty’ or ‘vanity’ panel – to smooth the appearance of the nose section. 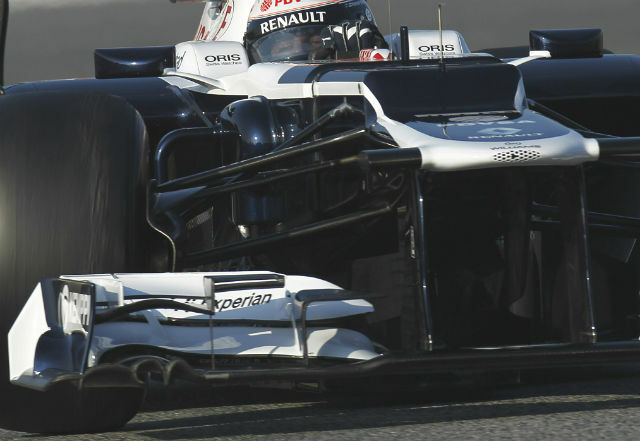 Williams has trialled both a stepped nose (above) and a smooth nose on its 2013 car (below). 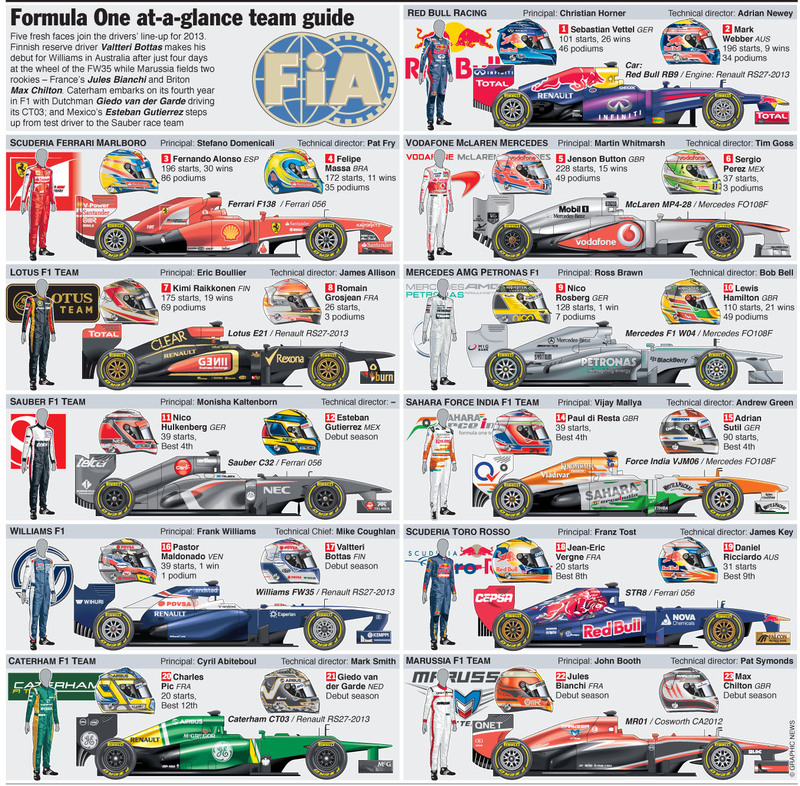 Red Bull and Sauber both have partial panels with vents whilst Caterham and Lotus have no panel at all. Whilst there has been much discussion about the panels many Technical Directors play down the importance of them “We feel that we want to run the nose and chassis has high as possible, so we have done that and used the vanity panel, aerodynamically it is close to neutral but it does tidy up the flow on the top of the chassis but the improvement is very small. It is not an area of performance at all. It is not what is going on on top of the chassis is whats going on underneath that matters” explains Force India’s Andrew Green. 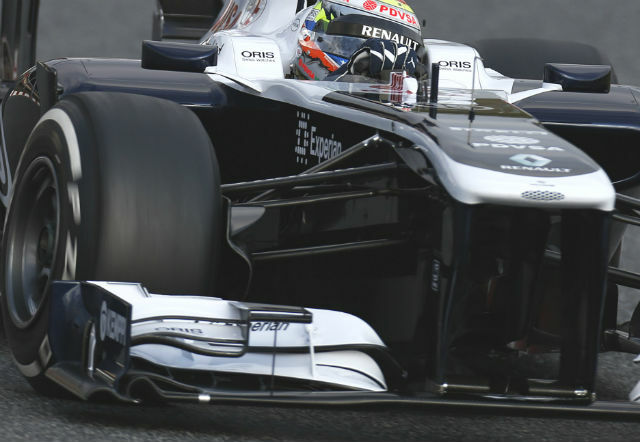 Flexible bodywork became a significant talking point over the course of last season, with a number of teams believed to have excessive movement in their front wing design and subsequently gaining aerodynamic performance. As a result of this a further deflection test has been introduced to ensure that the front wing assembly remains as rigid as possible as speed increases, thereby reducing the possibility of such advantages being made. Whilst continuing to limit the extent to which the tips of the front wing ‘droop’ under load, the new test will also ensure that the assembly is not capable of rotating the nose up or down around a lap. In years gone by, it has become accepted practice to allow front wing systems to run up to 3mm lower than the regulations prescribed. Decades ago when this trend was established, it was a nod to the difficulties of manufacturing and measuring to a precise tolerance. However, for many years it has been possible to be much more accurate in the production process, and so from 2013 the front wing height dimensions will need to be respected without any implied tolerance. This means that all teams will be forced to lift their front wing assemblies by up to 3mm, giving rise to a certain loss of front wing performance. A traditional Formula 1 suspension system has 6 members, namely the top wishbone front leg, top wishbone rear leg, lower wishbone front leg, lower wishbone rear leg, trackrod and push / pullrod. Although not previously exploited, it became clear during the 2012 season that it was possible to make a suspension system which satisfied the written rules, but which consisted of more than 6 members. The potential benefit of such a system would be that it could afford more aerodynamic surfaces to exploit. 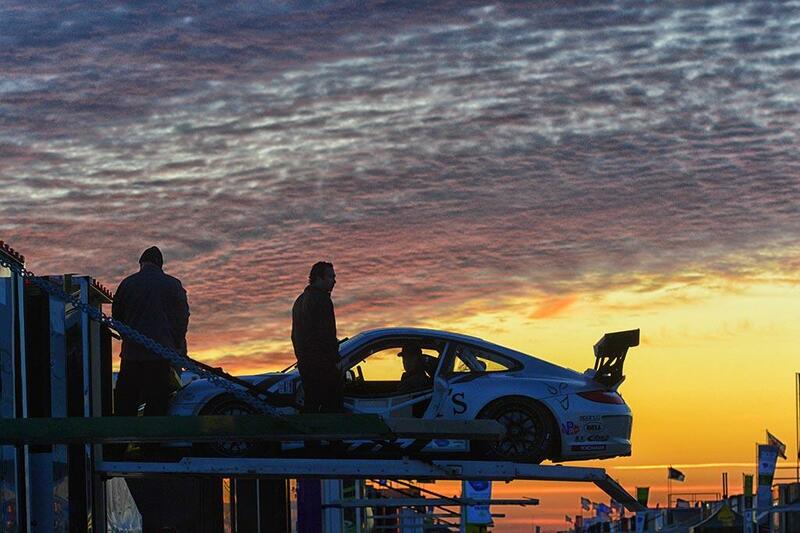 To forestall such a system, it has been agreed to amend the rules to limit all suspension systems to just 6 members. Minor increases in the weight of Pirelli’s 2013 Formula 1 tyre range have led to the minimum weight limit for each car and driver combination to be increased from 640kg to 642kg, with mandatory weight distribution regulations adjusted accordingly. In the weeks building up to the first test all Formula 1 chassis are subjected to a series of squeeze tests, where large forces are applied to the chassis to prove that it is strong enough to be used in anger. In the past, the first chassis under production was subjected to a special series of tests that were at 120% of the level applied to each subsequent chassis. As this difference was agreed to be somewhat spurious, the rule has been changed for 2013 such that all chassis must now demonstrate satisfactory performance at the higher level of load given to the first chassis, thereby providing further assurances in terms of driver safety. Since its inception in 2011, drivers have been free to deploy the DRS [Drag Reduction System] at any time which suits them during practice and qualifying. In 2013 however, new rules stipulate that DRS usage will be restricted to designated activation zones as used during the races themselves as part of on-going efforts to increase on-track safety. The changes to the DRS rules de-power the effect of DRS on lap time so there is slightly less incentive to put a lot of effort into maximising the switch versus the stability but there is still lap time there so is still a competitive pressure to make a knife edge wing profile which is difficult to do” explains James Allison or Lotus. In previous seasons, the ‘force majeure’ allowance has provided teams with some leeway in terms of fuel levels remaining in a car should it stop on the track during qualifying. This element has been removed from the regulations for 2013, with rules now stating that any car which stops out on track must have enough fuel for the mandatory one-litre minimum sample plus an additional amount proportional to the amount of fuel that would have been used in returning to the pits [as determined by the FIA]. With the 2013 grid fielding an entry list of 22 cars – reduced from 24 last season – there will now be six drivers eliminated at the end of both the Q1 and Q2 qualifying sessions as opposed to the seven ruled out at each stage in 2012. How many remember the movie Spinal Tap? The awesome scene where they are describing themselves as a more intense band than anyone else because the knobs on their amps go to 11….and all other bands stop at 10. Witness Audi’s new R8 V10 Plus on the dyno…..